Perfect to celebrate a job well done, an anniversary, toast the bride & groom or the new house! This Champagne Gourmet Gift Basket is filled with decadent treats including Columbia Crest Cabernet, Dilettante Chocolate Biscotti, Brown & Haley’s Chocolate Almond Roca, Chukar Chocolate Covered Cherries, Adams Place White Chocolate Covered Pretzels, Chocolate Almond Gourmet Popcorn, and Seattle Chocolate Co. Truffles. 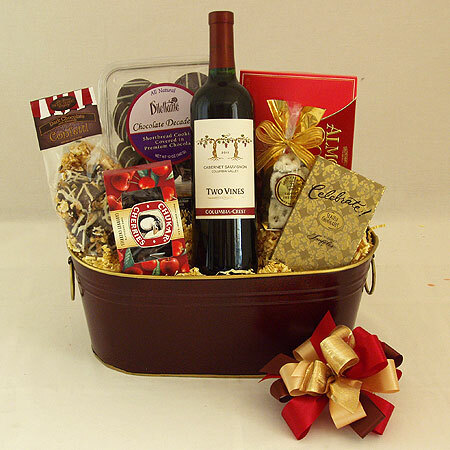 A lovely wine or sparkling cider gift basket festively arranged in a metal tin. See the pull down below to select other wine or sparkling cider choices.